I’m a procrastinator. It’s just my nature. I was one of those college students who would start working on a 20-page research paper the day before it was due, pull an all-nighter to get it done, and finish just in time to hand it in. Well, okay, I only did that once in college 😀 , but that type of procrastinating and then a last minute rush under pressure to get things done has been a recurring theme in my life. The problem with being a procrastinator who needs a little pressure to get things done is that when you work for yourself, there’s no one to apply that pressure. There are no due dates on my home projects. I don’t have a boss to answer to. I have the most easygoing husband who couldn’t care less if I ever finish anything. So it’s just me making my own decisions, working on whatever I want to work on from day to day, and putting off the things that don’t interest me. …still looks like that. Unfinished. Red oak in the raw. I’ve been so conflicted about how to proceed with it, and since I’ve been able to keep busy with other projects, I’ve felt no pressure to get it done. So I’ve procrastinated. I’ve put it out of my mind. But this is the year that these rooms are going to get finished. I’m determined. And in order to get the breakfast room and pantry done, I first have to address the floor. After all, what’s the point in refinishing my dining table for this room if I have no place to put it? Why spend time making window treatments if I can’t hang them? So this needs to be addressed immediately before I can even begin working on other projects. Here’s my issue. 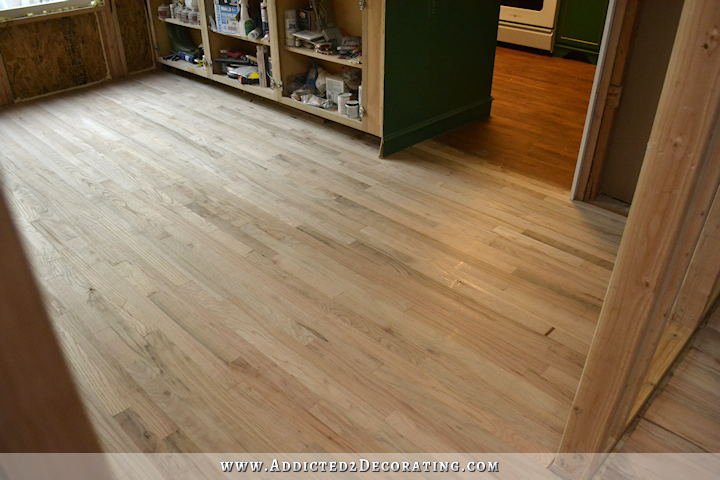 That breakfast room/pantry floor, as well as the floor in the kitchen, is new red oak flooring. The floor in the rest of the house is almost 70-year-old red oak flooring. I’ve wanted to just put a few coats of Waterlox on the floors throughout the house and leave it at that, but there’s no way that new and old oak floors will look the same color with just a clear coat. I’ve tried it, and they look awful together. The color is a day and night difference. So when I remodeled the kitchen, I mixed up a very light stain that I applied before the Waterlox in an attempt to color match the old floors. It worked great as long as I only had the one side door into the kitchen from the music room. 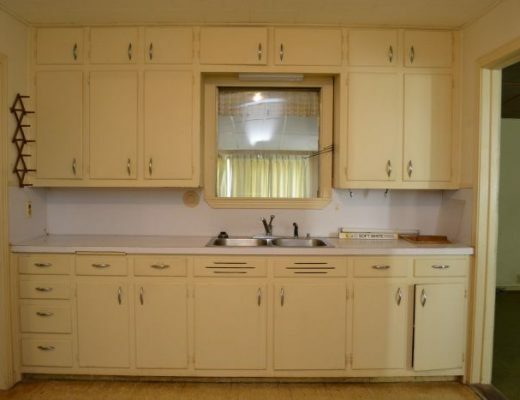 But then I went and cut an opening from the front room (living room) to the kitchen, and that changed things. Now there’s a very clear distinction in color where the two floors meet. The kitchen floor is very red, where the old floor in the living room is very orange. I’ve also been procrastinating because I couldn’t decide whether to just sand the breakfast room floor with my big 6″ rotary sander or whether to rent the big drum sander and edge sander. I knew that to do the job properly, I needed to rent the drum sander and edge sander, but I’ve been trying to convince myself that using my 6″ rotary sander would be adequate. I’ve seriously been wrestling with this whole flooring issue for about two months now, and I’ve finally made a decision. It’s time to stop procrastinating and get things done. Okay, honestly, it wasn’t really a decision to stop procrastinating. It was more a realization that the flooring issue is holding up every other project that I want to get done this year, so something needs to be done. Now. If you read my blog regularly, you know that I’m not really one to settle for things that didn’t turn out the way I had hoped. And after just over three years, I’ve learned that living with orange floors really bothers me. I also realized that in the amount of time it would take me to completely sand the breakfast room and pantry with my 6″ rotary sander on my hands and knees, I could probably sand the pantry, breakfast room, kitchen, music room, living room, and hallway with the big drum sander. And then I could stain the whole floor at the same time and make sure that I get an even color throughout. A non-orange color that I’m actually happy with. So I’m gonna go for it. I’m going to rent a drum sander and edge sander and get these floors knocked out ASAP so that I can get on with other things and get these rooms finished. This time, I will stain my floors a dark(ish) color to minimize the color difference between the old and new floor. And as much as I love Waterlox, this time I’m going to use quick drying water-based polyurethane. I just want them done as quickly as possible, and waiting 24 hours between coats of Waterlox will drag this on way longer than I want. Plus, polyurethane is about half the price of Waterlox. So now I just need to decide on the color. I’ve been looking at pictures of stained red oak flooring for the last two months, and I think Minwax Dark Walnut is my favorite. This floor has a mixture of half Minwax Special Walnut and half Minwax Dark Walnut. I think it’s also very pretty, and I do like that it’s a bit lighter (and less red), so it might not show dirt as much as the straight Dark Walnut. I really do like that floor with the half-and-half mixed stain on it, but to be honest, I just want this as simple as possible. I’d like to find a color straight out of the can that I can live with, and just get it done. So while I’m leaning towards the Dark Walnut just based on the pictures above, I’ll be testing out the Dark Walnut, Jacobean, and Early American on my floor and choosing from one of those. I have no idea when I’ll be starting on this. I’ve promised to finish my niece’s bedroom before I start on any of my own home projects this year, and I have a few more things to do in her room. But right now, we’re all hands on deck. My mom, my brother, and I are all working to get the finishing touches done, so I think we’ll have it finished in just a couple of days. And then it’s a trip to the tool rental shop for me. I LOVE Jacobean! It is my go-to stain color. Dark Walnut has too much red/orange in it for my taste. It’s actually what my kitchen counter tops are and I hate them. 🙁 I really want to redo them in Jacobean but I know what a huge undertaking that will be, especially with 3 little kids at home. I can’t wait to see your test samples and how your refinished floor turns out! Mine too! Jacobean made my ancient floors look so good. Dark floors are elegant and will go with all your future room designs and re-dos. I’ve been thinking that you need to address the orange/red all along, since it really impacts how all of the other colors in the room “read”. Especially with your new color palette. Also, big contrasts at the thresholds between rooms would drive me nuts. I love all of those stain colors, but keep in mind that whatever you choose will darken over time. So you may want to go light now, knowing that in a year or two it will be darker. Keep on plugging! You’re making the right decision. And sometimes what looks like procrastination is really just the necessary waiting until your gut helps you figure out the right decision. So go for it! It’s a big job, and I’m excited to watch as it progresses! I wouldn’t go dark. Dark floors darken and room and show every bit of lint and dust. Find a stain that approximates your existing floors. Will your pantry have a door? If so, a variance in floor colors will have a natural boundary and won’t even show unless you open the door. The pantry will have a door, but that’s not where the change in color occurs. 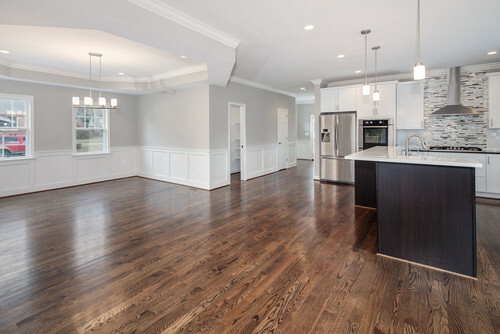 The change in color is between the kitchen and the living room, and the kitchen and music room, and there won’t be a door in either of those places. When picking out the color, just remember the darker the floor, the most the daily, normal dust shows. A medium tone hides it better. Otherwise you will be swiffering and vacuuming every day. (I have oak floors similar to what you have now and about the same age except for the new sections in my kitchen, hall and office (we matched prefinished oak boards in the areas we added hardwood with the existing reddish honey color (refinished several years ago) to almost a perfect match (my floors have polyurethane on them). Although I love the look of a darker finish especially in the wider planks, with a dust-generating parrot in the house, it would be a cleaning headache. I vac alot as it is. I love the dark shades but it’s true that the wood will get darker in time, so you might want to start out with something not at the darkest end of your colour palette! I really like the wood in the picture with the Jacobean. Cannot wait to see which you decide upon and what the look will turn out to be. Anyway, I think any of these shades will go much better with your new colour scheme than the existing floor. What a good start in the year in your house – to get the “foundation” done in order to be able to finish all of the decorating on top! Finish the floors when everithing is finished. Save it for last. And please finish these rooms, i am a big fan but repeeting and reedoing is taking the fun out of it. Fokus, and good luck. That makes no sense to me to do the floors last. Seems logical to do it now while the rooms are practically empty, rather than last when the rooms are filled with window treatments, accessories, and furniture. I think what she is saying is after you finish painting the walls and cabinets and right before you would bring in the furniture and stuff. I agree. I would wait until all trim, painting, and light installation has been done, but before decorating (window treatments, furniture, etc.) happens. You have said you like to be messy when working and the finish is unforgiving if it gets paint on it or scratched. It can’t easily be touched up. Also, maybe look into a high traffic poly that might better stand up to cat’s claws (I think you have a cat?) and Matt’s chair. Oil based poly takes longer to cure, but lasts longer than water based. That is something to consider. You may be out of the house longer if you use oil based, but it may be worth it in the long run for your forever home. I think that is the one I used (different looking label but it was 4 years ago and I am in Canada). It is holding up nicely and I don’t know if the stain would darken with an acrylic overcoat the same way as will oil based. 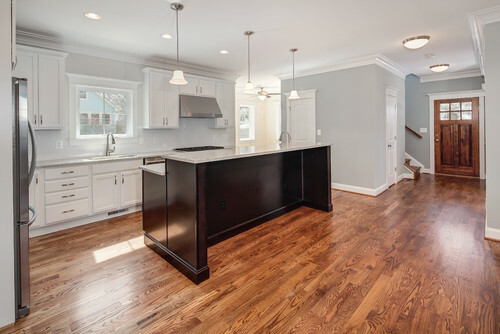 We used a mixture of the Special Walnut and Dark Walnut when we had our existing hardwood floors redone to match the new flooring we had laid after removing old carpet. It was gorgeous, and stayed gorgeous. We had circulating baseboard heat, so dust was not a huge factor, though multiple pets’ hair was a factor. Solution – get a Roomba. So glad you have made this decision. I think it is the correct decision and as you know, once you feel something is lending an off color tone to a living space, that is all you can see every time you enter the room. Get rid of it and for goodness sake, rent that big sander! No back pain or further delays. Are you positive that you’re done with all the drywall work/messy remodeling work in all these rooms? You originally went with the Waterlox because you could touch it up after doing major remodeling jobs and making major messes in these rooms. If you’re not completely positive, I wouldn’t seal with a polyurethane. I know you said you’re in a hurry to get it done, but you will regret it later if you end up tearing something out/making a big mess of the floors and they can’t easily be touched up. After watching your work process over the last few years, I say take the extra time to do the Waterlox so you have options going forward. My thoughts exactly. Waterlox gives you options to touch up, easily refinish, add new flooring. Polyurethane doesn’t. Also, in my house I have a polyurethane floor that meets up with a floor that finished with tung oil (I think waterlox is close to tung oil with some additives from what I understand). The feel of these floors is night and day. The polyurethaned floor is cold and feels like plastic (but durable!) and the tung oiled floor has a warm, natural feel that I personally love. Just something for you to consider. It seems when you pick easy or quick over what’s you love you redo it anyway. So taking the time now to do what you like vs what is fast may mean not redoing it later! We had a dark stained oak floor with a polyurethane finish in our kitchen in our previous house. I loved the color, but we also have dogs, and they were murder on that floor. It just seemed impossible to cover the countless scratches. If I had it to do over again, I’d definitely with a lighter color and use watertox since I’ve seen how well it has worked for you in the past. I used 1/2 Dark Walnut and 1/2 Special Walnut on my red oak stairs (to match my existing wood floors) and I love them! I’ve had them for over a year now, and have noticed no darkening. What I particularly like about them is that they don’t read red, orange or yellow, but just a medium-dark brown, which compliments the soft blues and beigey-grays in my house. The lighting in the stair well (which is open to the entry and living room) changes quite a bit throughout the day, and even with that, I am very happy with the color. I just used a large container and added an entire can of each color and mixed it up. It wasn’t difficult at all. I’m horrible with photography or I’d snap a picture and add it. 🙂 Also, as to clean-up, we vacuum a couple of times a week, but they don’t show every speck of dirt and dust (like my sister’s floors, which are much darker). For what it’s worth I think you are on the right track. 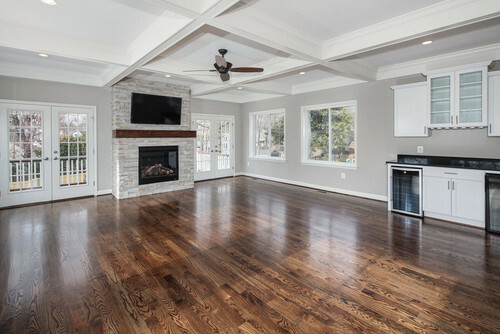 The wood floor should really be a consistent color throughout your house and you are right about the oak having a strong orange undertone in the other rooms. I would just suggest that you stay away from anything too dark and try to pick the stain with the most neutral undertone as possible. The less red and orange undertones, the better. Neutral wood plays nicely with any color scheme. You are a brave girl to refinish these floors on your own (but, of course we all know that you can!) and Matt is an absolute angel husband. Mine would have booted me out long ago (smile)! I would just caution you against using a drum sander. I did my house this summer, 4 rooms and a hallway, with floors that are in a similar condition to yours, with a U-Sand Orbital Sander that I rented from the local True Value. I started with a very rough grit (40) and worked my way up. I found it got right to the edges nicely and all I had to touch up by hand were the corners. I tried a drum sander once, years ago, and they are very unforgiving. Good luck! I didn’t know about these! We refinished our floors with the drum sander and this looks so much easier! When I refinished my maple floors 4 years ago ( with my dad’s help) we tried the orbital sander. After a day (8 hours of sanding) we hadn’t even gotten through the layers of oil based varnish. I was so discouraged because my floors were still an orangey colour. I tried a Dark stain and it stillness pulled up orange. In the midst of my tears my dad asked if we shouldn’t try the drum sander. We went for it and within 1/2 hour my LR floor was showing a beautiful light maple colour with no orange tone. I ended up leaving them natural because I was so happy with them. I think the drum sander will make the job of removing the oil based Waterlox much easier. I totally agree! I hear the drum sanders can do some terrible damage if you aren’t careful. SO glad you will address the floor color. It will make such a difference when the “orange” is gone. As to comments about dust ‘n stuff on dark floors; this is Kristi, the Texas Tornado, the Queen of Remodel & Re-do! She and Matt aren’t bothered by “messes” that would send “neat nicks” to the asylum. Dusty floors aren’t going to bother them IMO. Yes, dirt, crumbs, and dust shows more on my darker hardwoods, but I love my floors! I have a Dyson stick vac that I use often. Works like a charm to clean up between bigger cleanings when the dust bothers me or before guests come over. 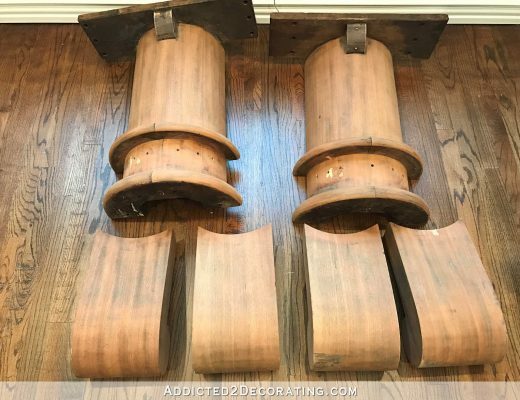 I refinished my red oak floors in dark walnut and polyurethane and I love them. The dark color is gorgeous and it provides a nice rich color to contrast the blues and green colors I decorate with. I think the level of gloss you choose to finish with makes a big difference on the visibility of dust. The lower the sheen the less things seem to show. A friend was in the process of re-doing their floors, they got a color similar to Jacobean. Some paint came off the baseboards during the process and a few flecks were missed and got poly’d in. It showed a tad more dust, but hid occasional white paint flecks well. I was very surprised how much that color grew on me when it was previously a yellowy oak finish on narrow boards. Two words from personal experience with dark walnut. CAT HAIR. I have multiple floor cleaning devices and they got a workout. Your house is beautiful. You are very inspiring. I have dark floors and I absolutely without any reservation…..ADORE them!!!!! I only read your blog and sort-of another, but your post reminded me of this one: http://www.mycrappyhouse.com/the-fantastic-floor/ – it even has some samples that look like what you like! You are not alone! 😀 (and also, I almost put off my own renovation another year because I was trying to find out what to do with the floor). Please take the time to do the floors so you’ll end up loving them for years. You’ve mentioned time after time how you like the Waterlox finish. You’ll make it look beautiful either way, but rushing now and using the polyurethane could be something you don’t like, long-term. Go for the special walnut/ dark walnut mix. Beautiful, but won’t show every little dust particle and pet hair. I know you don’t mind dust and mess while you’re in the middle of a remodel, but when it’s all finished, you will appreciate a cleaner looking floor without constant vacuuming. Just a warning before you jump in to sand your older floors again: I live in a house built in the 1940’s and when I was renovating and had pros come in to sand and refinish my oak floor, they took one look and said they had been sanded too many times in the past and doing it again would cause the nail heads to be too close to the surface. They wouldn’t do them! So I ended up having someone else install a new oak floor just like the old oak floor. Look closely before you refinish yet again. I like that idea and think that the floors will look great in each room and provide a cohesiveness throughout the whole home. Just make sure you get enough product for the rest of your home so you have the same batch number and same coating. When we bought our house, the oak floors were stained Dark Walnut. They definitely had a wow factor. 7 years later…and wanting a brighter, non dust showing floor– we striped them and put a clear coat on them!!! Our house seems so much brighter and I never see the dirt or dust anymore!!! I know they aren’t as “in”… but we are so much happier! Hi Kristi. Have a look at Bona DriFast oil modified stains. 2 hour dry time, super nice colors. DuraSeal is another fast dry stain with fabulous colors. I agree that you will be happier once you get all of your hardwoods tied together with a common, more neutral stain. Suggest also that you apply a matte seal coat. The shiny plastic-y look is yesterday’s news. Love watching all of your projects come together. Such talent! Love the mixture with the lighter look – think it would go very well with your bold colors, whereas the dark ones might end up with everything a little bold….just my thought. So admire your daring to tackle such projects! I am just amazed and encouraged. Bought the Porter air combo you recommended and just finished my planed wall in the living room! Wow, what a learning experience for a 73-year old!! Such fun. I had dark walnut stained red oak floors in my previous house. 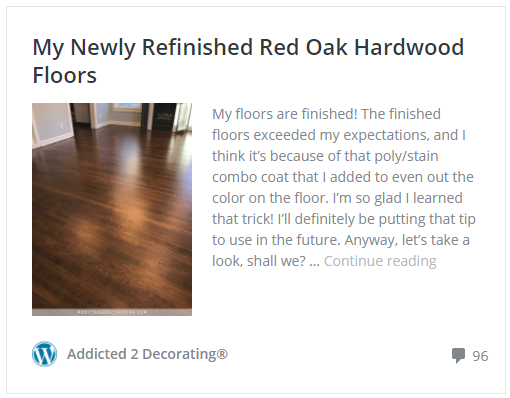 New house has pre-finished floors with a reddish tint and this post reminding me how much I miss the warmth of the dark walnut stain…it’s not that dark and seems to compliment the colors you are integrating into the house; blues, greens so I say go with your gut and for dark walnut. I am not housekeeper of the year but did not have issues with a lot of dust showing because of the color of the dark walnut stain. Kristi all of a sudden I am not getting your E-mails. I didn’t stop them and I don’t know why this happened. I LOVE your blog. I am going to sign up again because I don’t want to miss anything you do. Thanks. I am glad you decided to redo all the floors to get the consistent look, but happier yet you are renting the necessary large sanders! Faster and cheaper than the massages/physical therapy you may require after doing so much work on your knees! Not long ago I refinished our stairway to match our walnut floors. I had heard a lot about General Finishes stain and varnish so I used them. Oh my goodness what a wonderful product. The varnish went on smoothly and you could even go back over it immediately unlike other varnishes. I would highly recommend this product. It is a quality product. I am so glad someone told me about it. Your are truly amazing in all you accomplish. You go girl! Kristi, I don’t know if this product is right for your project, but it’s worth checking out…Rubio Monocoat.http://www.rubiomonocoatusa.com/en plus lots of examples on Instagram as well. It’s a hardwax oil. Penetrates the wood rather than sitting on top like polyurethane does, it can also be touched up. I used their cotton white on my new wood countertops…I’m impressed. Easy to apply…I applied by hand…A beautiful matte finish and a raw look on the wood..the white toned down the orange in the wood. Don’t know how diy friendly it is for floors and trying to match new and old wood, but it’s no VOCs and one coat! There is also a bunch of colors and samples you can try out. You might consider using two different colors to get them to match. I’m going to use it on my unfinished white oak stairs next. Pretty excited about finding this. I think the Jacobean is a good choice and you don’t have to mix it. 1) I don’t think you’re going to be happy with the poly. Especially since you have a tendency to not cover your floors when you work on the room. The Waterlox is way easier to patch-up. 2) I have this sinking feeling you’re not going to like Minwax stain, either. Minwax is notorious for bringing out all the ugliness and heavy dark grains in wood–no matter the color, and every time I’ve seen you do something that brings out grain, you paint over it. In fact, didn’t you just do a post about this like a month or two ago? 4) Since you’re redoing, have you considered the option of having two different floor colors? 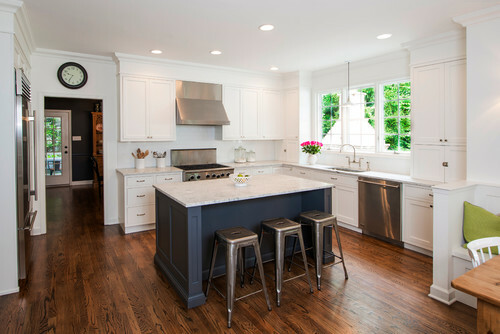 As long as there’s a visual threshold between the rooms (if not a physical one) and the colors are significantly different, it could look perfectly fine to have, say, dark floors in the kitchen and dining room and natural floors in the rest of the house. After all, you were going to paint the kitchen floor originally, anyway. Remember the stripes? Feel for you ,and certainly know how you feel. My Hubby is just like you. And somehow it works out in time. Im sure once you get started you will fly on with the work. I love the Jacobean. I think that would go well with your blues, greens, etc. I meant to comment yesterday. We have red oak floors and they are stained dark walnut. We have 2 little fur babies (terriers) and yes, there is hair. I don’t mind swiffering, I also don’t mind looking at hairballs until I feel like swiffering. I like the looks of the floors from a decor standpoint. We did recently get a wand vacuum but we are in the midst of remodeling our bathroom (our contractor is in the midst of remodeling it actually) and I’ve let the sweeping slide so I’m not sure how the new vacuum works on those hairballs yet. I like the hard wood with area rug look, not strict hardwoods. Have you looked at the colors offered by General Finishes? I understand their stain is superior to Minwax. I think this is the worst idea every. I have dark floors, and you are never done cleaning the. Ever. Just sweeping on them, by the time you’ve done the room, the dust you stirred up in the beginning of the room will have settled, and it’ll be dusty looking again. That’s all fine and well if you’re a neat person who enjoys keeping a super clean house, but you’re not Kristi. That’s not a critique (I’m the same way) that’s just a fact, and it will result in your house basically never being clean again, because if you don’t keep up with dark floors daily, they are ALWAYS dirty. Especially when you’ve got construction projects going on (like I do, and you do) because construction projects make so much fine dust. Even just cutting fabric creates fine dust that shows madeningly on dark floors. And really… you will NEVER be done doing construction projects in that house. With dark floors, and cats/construction projects creating fine dust, you’ll need to clean your entire floor, including moving almost ALL the furniture, every time you plan on having company over, because there will be all these lines of ‘shady’ dusty areas around, and under furniture, where a normal day to day sweep and vacuum doesn’t reach, which make it look like you NEVER clean, and you just quickly swept up the main areas for the company’s benefit, except that it’s still obvious to everybody how dirty you really are, because really… look at the dust under that end table over there. 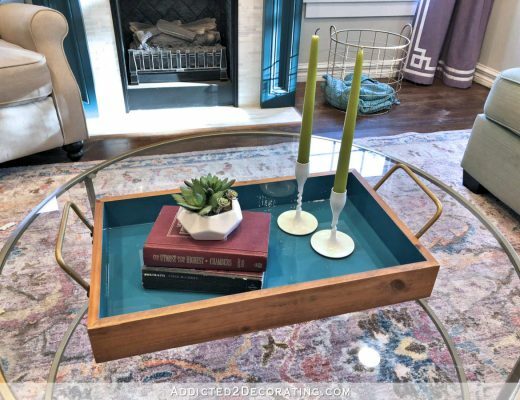 Except… it’ll look like that under the end table after just a few days… so if you don’t want your house to look like you never clean, and just swept up for the purpose of entertaining, you will need to move all the furniture to clean under it before you entertain. If you get unexpected company to come over, and it’s been move than a week before moving all the furniture and cleaning under it, your house will look filthy, even if you just finished sweeping. I also think doing a poly is a terrible idea for you, for all the reasons people have already mentioned: you’re not nice to your floors. If you put a poly on it, you can’t spot fix it, and so in a year’s time, it’ll look awful, and you’ll end up redoing them again anyways. I know you’re eager to get on with things right now, and you don’t want to waste the time waterloxing, but really, based on your track record, putting a poly on it right now will just mean that you save some time right now, but that you’ll still have to put in the time to waterlox them in a year or two, because you’re not going to be happy with the results long term. I think the Jacobean will play more nicely with your color scheme. We have jacobean floors, and I really wouldn’t call them “dark” at all. I think they’re a nice rich medium color, and they’re not dark enough where they show every speck of dirt (like say going all the way to ebony would) Our are on white oak, so they’ll have a little less red/orange undertone than yours, but still a very lovely color, that feels classic and not the slightest bit trendy. I’d recommend you sample a number of small patches of color before you start, on both the new and the old. When we have a professional refinish both old and new floors on one of our jobs, the colors between the new and old floors (meaning the actual mix of the stain colors) are sometimes different, if the delineation line occurs at a straight point between rooms- like between the kitchen and living/music room. Additionally, I’d say on 95% of our jobs, the stain color of the floor is generally a mix multiple stain colors where they mix both dark walnut and jacobean, or even mixing between minwax duraseal varathane etc. In terms of the color saturation, the other thing you should explore is the wet versus dry staining. It affects how the wood takes the color, and the differentials between the dark and light grain. On our floors, since they’re rift and quartered white oak, it makes a difference but not one it was worth the frustration to address. With the cathedral graining in regular red oak, it might be something to look into, as other have noted, you might not be happy with how the grain looks and the contrast when stained dark. We are going to be getting our hardwood floors refinished, too, and I asked several contractors about the water-based poly. They both said that it is not recommended over dark stains. One said that it develops whitish spots in the grooves that is noticeable over the dark stain (or something to that effect.) So you might want to look into that. P.S. As far as stain color goes, I would stay away from anything too dark because it is so far to one extreme end of color trend. I am old enough to remember the last time very dark floors were in style–( in the late 1970’s and that is the phrase we used to use, LOL) when they went out of style they were REALLY, REALLY out! Medium dark might be safer–it never gets too far from whatever shade is popular and “on trend” at the time. Just saying…. 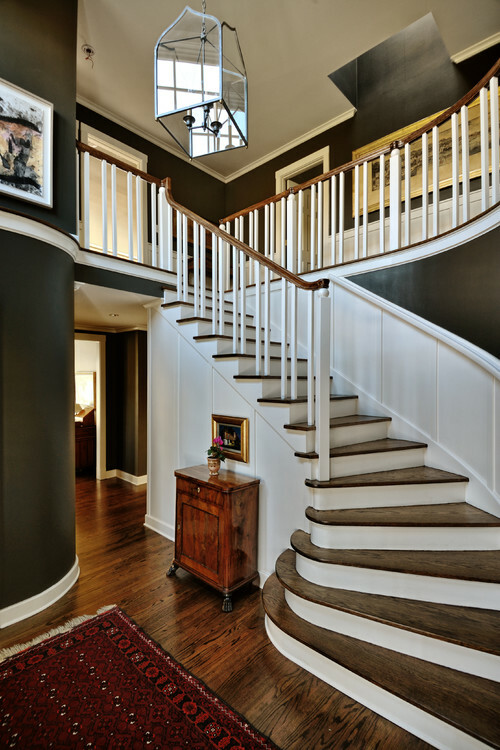 I love English Chestnut by minwax, btw–have it on some stair handrails, and am thinking of using it when I refinish my floors. Wow, lots of info in these comments and I’ve nothing to add except Sarah G makes a lot of sense!